Wang Wei (Traditional Chinese: 王維; Simplified Chinese: 王维; pinyin: Wáng Wéi, also known as Mochi (Mo-ch’)) (701 – 761), sometimes titled the Poet Buddha, was a Tang Dynasty Chinese poet, musician, painter and statesman. He exemplified the ideal of the Chinese scholar official, maintaining a successful career as a bureaucrat in the Tang court, while remaining detached from the passions of everyday life. When the capital was occupied by insurgents during the Anshi Rebellion (755 – 759), he avoided actively serving them by pretending to be deaf. Wang established a country estate at Wangchan, where he frequently retired to write poetry and paint. Wang Wei is known for his monochrome landscape paintings, expressive of Chan (Zen) Buddhist ideals and is credited with introducing the painting technique known as “broken” or “splashed” ink (pomo), though it is known to have been used earlier. Broad up-and-down strokes are made using a brush, and ink is applied in patches or washes that leave blank spaces on the paper or silk. His paintings exist today only in the form of rough copies by later artists. Wang is best known for his quatrains depicting quiet scenes of water and mist, with few details and little human presence. The deceptive simplicity of his works, the fruit of long preparation and much practice, but apparently achieved without conscious effort, embodies the Zen ideal for living. Wang Wei was born in 701 in Shanxi. His father was a local official and his mother came from a distinguished literary family. When he was sixteen, Wang and his brother were introduced to society in Chang-an. He passed the civil service entrance examination in 721 and was immediately appointed Assistant Secretary for Music. After a minor incident he was exiled to the provinces in Shantung, where he remained at his post for several years before resigning and returning to Chang-an. He married and began building up an estate in the Changnan hills south of Chang-an, which he visited whenever possible. Wang spent ten years studying with Chán master Daoguang. After his wife's death in 730, he did not remarry and developed a deeper interest in Buddhism, establishing a monastery on part of his estate. He returned to government service, dividing his time between his estate in Changnan and his missions, including three years spent on the northwest frontier. He amassed several fortunes and gave generously to monasteries. When his mother died in 750, he retired and went to Changnan to write, paint and meditate. During the Anshi Rebellion (755 – 759), he avoided actively serving the insurgents during the capital's occupation by pretending to be deaf. He was forced to collaborate with them, for which he was punished with a brief imprisonment when the rebellion ended and order was restored. He was quickly returned to government service, becoming Chancellor of the Tang court in 758, a position which he still occupied at his death in 761. Wang Wei was the first Chinese painter to paint only landscapes, and to express the spiritual quality of his scenes. He eschewed the bright colors used by most Tang dynasty painters, and worked mostly with black ink and sometimes with light color washes. This style of monochrome painting is an extension of calligraphy and has been associated with Chan (Zen) Buddhism. Wang Wei is credited with introducing the painting technique known as “broken” or “splashed” ink (pomo), though it is known to have been used earlier, in the seventh century. Broad up-and-down strokes are made using a brush, and ink is applied in patches or washes that leave blank spaces on the paper or silk. None of his original paintings survive, but copies of works attributed to him are also landscapes with similar qualities. 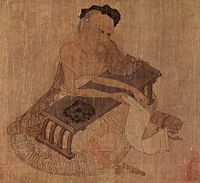 In later treatises by Chinese painters, there are praises of a long, horizontal rolling scroll which he painted depicting his estate in Wangchan; rough copies of this exist, but the original has not been found. Zhang Yanyuan, a late Tang dynasty historian and painter, claimed to have discovered an essay on painting landscapes written by Wang Wei, in which he encouraged artists to trust their instinct more than their brushes, and stated that it was not necessary to add detail to landscape features that were in the distance. He gave several rules for the composition of landscapes: clouds should obscure the middle of mountains, waterfalls should cover sections of large rocks, trees should partially hide pavilions and towers, and human and animal figures should obscure roads. Morning was to be depicted by light mists in the dawn over the mountain, and evening was to be shown by the sun setting behind the mountains. Wang influenced what became known as the Southern school of Chinese landscape art, which was characterized by strong brush strokes contrasted with light ink washes. Wang Wei is considered one of the great poets of the Tang Dynasty, along with Du Fu and Li Bai. While Du Fu’s stoicism embodied Confucian ideals, and Li Bai’s brilliant improvisations exemplified the Taoist attitude that the universe is unknowable and unfathomable, Wang Wei was a Buddhist mystic, viewing the world with a detached compassion. He portrayed life as an illusion, whose ensnaring passions and appetites keep us from our better selves, especially in the turmoil of court life. Of the three, Wang Wei was the only one who maintained a successful career in the Tang bureaucracy, and even he spent a considerable amount of his time at his estate in the countryside or reflecting on nature. Humble, extremely capable but detached from the passions of everyday life, Wang exemplified the ideal of the scholar official. His four hundred poems were included in many anthologies. Not pity the flowers fallen! Wang is best known for his quatrains depicting quiet scenes of water and mist, with few details and little human presence. He has been praised for “putting painting into his poetry and poetry into his painting.” The deceptive simplicity of his works, the fruit of long preparation and much practice, but apparently achieved without conscious effort, embodies the Zen ideal for living. Wang Wei's most famous poems, including the poem "Deer Park," form a group titled “Wang River Collection,” recording a poet's journey, ostensibly that of Wang Wei and his close friend, Pei Di. They have inspired poets for centuries, including modern works such as Pain Not Bread's Introduction to the Introduction to Wang Wei, Barry Gifford's Replies to Wang Wei, and Gary Blankenship's A River Transformed. One of Wang Wei's poems, called Weicheng Qu or "Song of the City of Wei" has been adapted to the famous music melody, Yangguan Sandie or "Three Refrains on the Yang Pass." The most famous version of this melody is that composed for the guqin, which Wang Wei probably played. 《竹里館》 "Hut in the Bamboos"
I thrum my zither, and whistle lingering notes. Only the clear moon, comes to shine on me." Before my latticed window blossomed yet? ↑ 1.0 1.1 Dorothy Perkins, Encyclopedia of China the essential reference to China, its history and culture (New York: Facts on File, 1999, ISBN 0816026939), 550-551. ↑ 2.0 2.1 2.2 2.3 Poetry-Portal Retrieved December 4, 2007. ↑ Wan Wei Poetry Retrieved December 4, 2007. History of "Wang Wei (eighth century poet)"
This page was last modified on 18 October 2016, at 14:39.